Teacher Training providers in Hull & Humber region join together to encourage new teachers into the profession. National shortages of teachers are well publicised, including those in the Hull and Humber region. A group of leading local teacher training providers have joined together to offer local people the opportunity to find out more about going into teaching as a career. 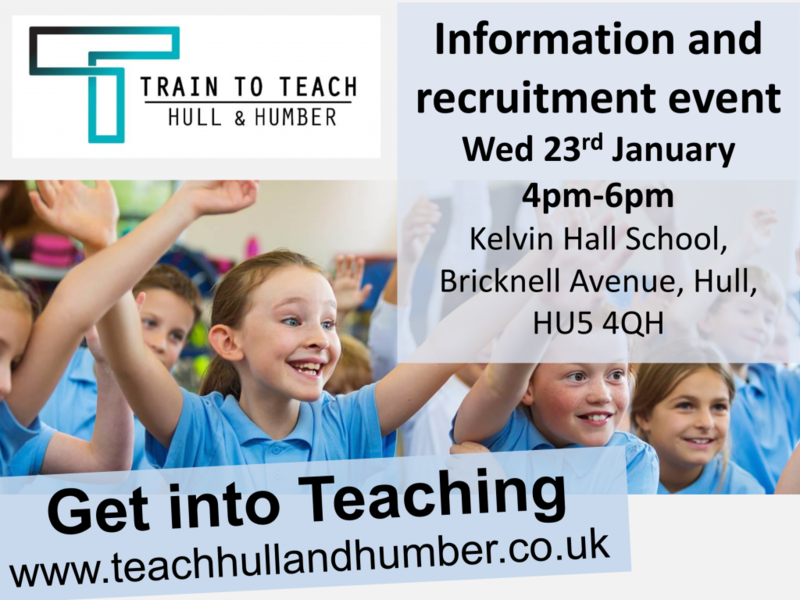 ‘Teach Hull and Humber’, a local Initial Teacher Training network, are hosting event from 4pm-6pm on Wednesday 23rd January at Kelvin Hall School where all local providers will be present to discuss possible training routes into a teaching career with anyone from the local area who is interested. The event is free, and will be attended by all local providers of Primary and Secondary teacher training. Jonathan Boden, the chair of the Teach Hull and Humber network said: “If you have a degree and are interested in a career in teaching and want to have a positive impact on the children in the local area, this is a great opportunity. It is great that all local providers are working collaboratively to improve educational standards in the region by seeking to attract high calibre new staff to the teaching profession. “If anyone is considering, or has ever previously considered, a career in teaching then there is no better time than at present, as national teacher shortages mean that successful candidates can be eligible for a tax-free bursary or a scholarship, or a salary – as well as the chance to train alongside experienced teachers in some of the leading schools in the region. Providers at the event will also be offering the opportunity to reserve places for School Experience visits to observe teaching and learning in action in local schools. Be the first to comment on "Major drive to recruit more teachers"